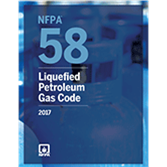 Enforced in most states and referenced by DOT, NFPA 58: Liquefied Petroleum Gas Code provides minimum safety requirements for all liquefied petroleum gas (propane) installations -- from small cylinders installed at residences to large bulk storage facilities that can exceed 100,000 gallons. It includes minimum requirements for safe handling during LP-Gas transfer, including operator qualifications, maximum filling quantity in containers, and pre-transfer inspections to ensure containers are fit for continued service. NFPA 58 also covers a number of safety requirements related to container construction; piping design; separation of containers from homes, stores, schools and other important buildings; and safe handling of liquefied petroleum gas during transfer between containers. Updates help designers, safety and risk managers, AHJs, and insurance professionals effectively address today's LP-Gas hazards. An all-new chapter (Chapter 12) updates the technology now available for over-the-road vehicles utilizing LP-Gas. New definitions, construction, transportation, and location requirements have been added for skid tanks and porta-pacs. NFPA 58's scope is expanded to include hot air balloons, with requirements referencing the current state of federal law regarding their use and construction. The newest edition also includes new requirements and guidance on how to conduct liquid transfer into these containers that were previously not covered by the Code. Revised snow load requirements for container or piping protection are based on calculations and snowfall maps from ASCE 7. The threshold for protecting containers and appurtenances from snow has been raised to 100 lb/ft2 (488 kgf/m2). Basic fire extinguisher requirements are centralized to Section 4.7, with individual capacity requirements remaining in the specific application section. Appurtenance requirements in Table 5.9.4.1(B) are expanded to cover containers (except DOT Spec. 39, less than 2 lb. propane capacity). Universal tanks are permitted to be filled in the horizontal or vertical orientation, as long as the positioning slot is in the correct orientation. New requirements in Chapter 6 address the placing of ASME tanks that have been disconnected from use. Vehicle barrier protection (VBP) for cylinders protected in a metal cabinet have been removed, along with changing the VBP requirement for 12,000 lb. (53,375 N) protection for vehicle fuel dispensers to 6,000 lb. (26.688 N). Interested in other editions of the NFPA 58? Use the drop down menu above to select the edition year you need. 4.1 Acceptance of Equipment and Systems. 5.10 Regulators and Regulator Vents. 5.11 Piping (Including Hose), Fittings, and Valves. 5.14 Valves Other Than Container Valves. 5.24 Vaporizers, Tank Heaters, Vaporizing Burners, and Gas-Air Mixers. 6.5 Other Container Location Requirements. 6.7 Location of Transfer Operations. 6.9 Installation of Container Appurtenances. 6.15 Hydrostatic Relief Valve Installation. 6.16 Testing New or Modified Piping Systems. 6.17 Leak Check for Vapor Systems. 6.18 Installation in Areas of Heavy Snowfall. 6.21 Bulk Plant and Industrial Plant LP-Gas Systems. 6.22 LP-Gas Systems in Buildings or on Building Roofs or Exterior Balconies. 6.26 LP-Gas Systems on Vehicles (Other Than Engine Fuel Systems). 6.27 Vehicle Fuel Dispenser and Dispensing Systems. 6.28 Containers for Stationary Engines. 6.30 Alternate Provisions for Installation of ASME Containers. 7.3 Venting LP-Gas to Atmosphere. 7.4 Quantity of LP-Gas in Containers. 8.4 Storage Outside of Buildings. 8.5 Fire Protection and Electrical Area Classification. 8.6 Automated Cylinder Exchange Stations. 9.3 Transportation in Portable Containers. 9.4 Transportation in Cargo Tank Vehicles. 9.5 Trailers, Semitrailers, and Movable Fuel Storage Tenders, Including Farm Carts. 9.6 Transportation of Stationary Containers to and from Point of Installation. 9.7 Parking and Garaging Vehicles Used to Carry LP-Gas Cargo. 10.2 Separate Structures or Buildings. 10.3 Attached Structures or Rooms Within Structures. 11.5 Quantity of LP-Gas in Engine Fuel Containers. 11.7 Piping, Hose, and Fittings. 11.8 Installation of Containers and Container Appurtenances. 11.9 Installation in Interior of Vehicles. 11.10 Pipe and Hose Installation. 11.13 Industrial (and Forklift) Trucks Powered by LP-Gas. 11.14 General Provisions for Vehicles Having Engines Mounted on Them (Including Floor Maintenance Machines). 11.15 Engine Installation Other Than on Vehicles. 12.4 ASME Containers, Materials, and Equipment. 12.7 Installation of Pipe, Tubing, and Hose. 12.8 Protection of Pipe, Tube, and Hose. 12.9 Testing of Piping, Tubing, Hose, and Fittings. 12.10 LP-Gas Liquid and Vapor Injectors. 12.11 Fuel Rails and Distribution Blocks. 12.14 Servicing, Parking, and Display of Vehicles Indoors. 13.1 Construction and Design of Refrigerated Containers. 13.2 Marking on Refrigerated LP-Gas Containers. 13.4 Refrigerated LP-Gas Container Instruments and Controls. 13.5 Refrigerated LP-Gas Container Impoundment. 13.6 Inspection and Testing of Refrigerated LP-Gas Containers and Systems. 14.4 Inspections Prior to Transfer. 16.1 Sizing Pipe and Tubing.